Makes a lovely handmade gift idea for Easter or Springtime! 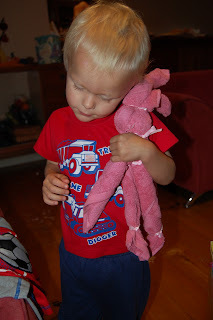 My teaching friends Jennie and Jemma were given a Washcloth Bunny Rabbit as an easter gift, and when he was three, I made Ned his very own pink one. He did love pink! There is still time to make one for your children this Easter too. They are so simple, and yet Ned loved his bunny just as much as his other favourite cuddly, the doll I made him when he was a baby. If you are planning for a handmade/homemade Easter this year, this will be marvellous! All you need are two wash cloths (face washers) and a hand towel. I bought a set of 2 handtowels, and a set of 4 washcloths (to make two rabbits) for less than $7! So I made one rabbit for Ned, and another for his best friend, neighbour Bella. Start with the hand towel. Place it on the diagonal, then tuck up one corner as shown. Roll it up tight to make a long sausage shape. Next, roll up the two wash cloths, just like this. One for the arms, one for the ears. This is the placement. You’ll need a long length of pink ribbon and scissors to put it all together. Firstly, use your thumbs to push the top washcloth as far to the top of the handtowel as possible, making sure to have a ‘clean’ area for the face, and ensuring the ‘legs’ stay even. Tie a knot, but double the loop over twice before you pull the ribbon tight, and it will lock into place securely and not slip. Push the ‘arm’ washcloth towards the tied-off neck of the rabbit. Tie a knot in the ribbon to secure this too. Push the ‘ears’ skywards, and tie a ribbon around the ears to secure them into a pair. Knot firmly. If you like, you can also tie ribbons around the feet. Or not. Simple but elegant. I REALLY, REALLY, REALLY LOVE this rabbit. And I’m so glad that Ned did too. What a fantastic idea…. I would love one of these! Thanks for you lovely comment – I often visit you for some inspiration you know! I lurk too! I so wish I had more hours every day to visit my favourites and leave comments too. Just to let people know I do visit! That’s a cool idea! I’m going to file it away for next year. That’s my trick Louisa. Loving pinterest now as I can keep everything in one place.